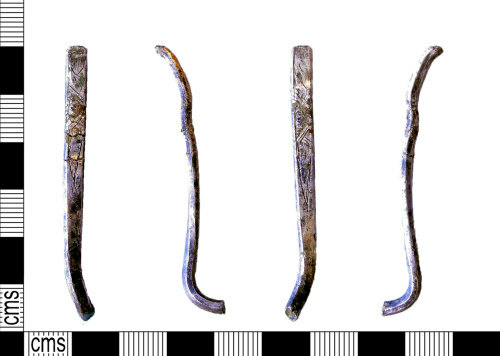 An incomplete silver Bodkin dating to the Post-Medieval period (AD 1600-1700). The object is the majority of the shaft of a bodkin with the upper and lower portions missing due to old and abraded breaks. The shaft is broadly rectangular in plan and section and tapers slightly in towards the lower end. The upper knop and pointed terminating end are missing. The shaft has an incised decorative pattern, some of which is obscured by wear. The visible portion of pattern is an incised V within which is cross hatching on both sides. The object has a distorted shape. Similar examples can be seen on the Portable Antiquities Database: LEIC-6A9087 2015-T979, BUC-816668 2016-T524 and WMID-F16806 2014-T623. The object contains a minimum of 10% precious metal and is over 300 years old. Consequently it qualifies as Treasure under the stipulations of the Treasure Act 1996 in terms of both age and precious metal content.